What a night! 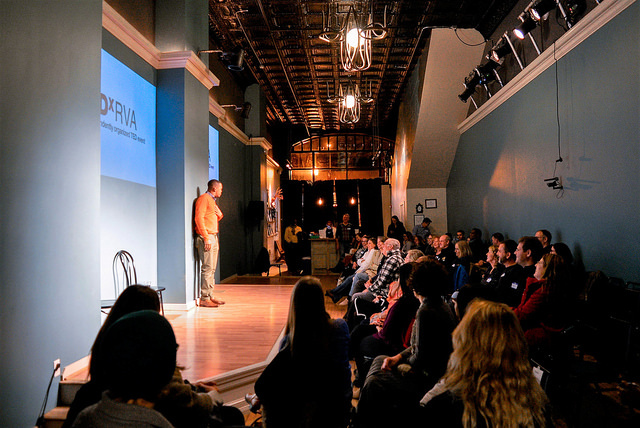 Last Wednesday on December 13, 2017, we held our last salon of the year, “Humor for the Holidays” at Coalition Theater and celebrated the end to an eventful year of TEDxRVA. On an extraordinarily chilly day, we warmed up with delicious snacks from Little Saint and Mon Chou, both new businesses in town that are definitely worth a visit. We opened the night with Michael Jr.’s “More Than Funny” which brought the entertainment of comedy together with the critical thinking of what we’ve given to the world thus far and what we’d like to give in the upcoming year. While some folks came expecting a night of improv or stand up, they walked away with so much more. Our discussion groups went over what Michael Jr. described as our “set up” (the gifts and challenges we’ve been given in life), and our “punchline”(what we plan on giving to our community as a result of our “set up”). We spoke about the resources we wished we had access to in order to make our purpose or “punchline” a reality, and some attendees surprised themselves when they realized for the first time what exactly their punchlines were! The night did not end without a few live jokes, which were brought to the stage by none other than former TEDxRVA speaker, current TEDxRVA volunteer, and nationally known comedian Micah “Bam Bamm” White. CLICK HERE to watch his TEDxRVA talk from 2015. If you’re interested in volunteering with TEDxRVA in 2018, follow this link! Another huge thank you to Coalition Theater for providing our cozy venue, Little Saint and Mon Chou for donating our celebratory snacks, and to Sidd Kumar for being the night’s photographer. It’s due to their generosity, and the generosity of so many other wonderful sponsors this year, that we were able to make these events possible! Sign up for our newsletter to receive updates for what’s to come!